Before you read this short history, why not check out how I'm connected to this Harrold line? Our family history begins with an Amasa Harold. Amasa Harold was born around 1775 in North Carolina. We don't know who his wife or parents are, but we do know of two sons: Uriah Harrold and Andrew Harrold. At the end of the 1700s there was a large and fairly well documented Quaker Harrold family in North Carolina, and it is safe to assume that our Amasa was one of them. But, to assume can be a dangerous thing when we research our family history, so we don't make the connection without more evidence. Amasa Harold moved with his family across the border to Tennessee sometime before 1830. He shows up in an 1830 census in Tennessee. In the 1850 census of Greene County, Tennessee, we find Amasa Harold living with his son Andrew Harrold and family. What we can tell about these Harrolds is that they were fairly "common" folk - farmers, millers, blacksmiths. This would be consistent also with the Harrold's from North Carolina, but again, we can't make that connection just yet. 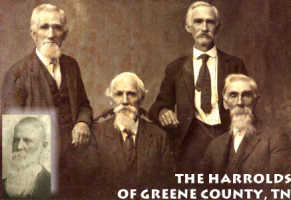 Andrew Harrold and his family stayed in the Greene County, Tennessee area and many of his descendants live there to this day! But, we follow Uriah Harrold's family up to Illinois around 1862. It seems that Uriah Harrold died and his wife Susannah (formerly a Dillon) brought the family north around the beginning of the Civil War. This Harrold clan populated the area around Vermilion County, Illinois. Uriah Harrold and his wife Susannah (formerly a Dillon) had many children. The photo on the main page of our site is one of those children, Marion Alexander Harrold. There is more evidence of a Quaker link with our Harrold heritage. Even in Illinois, the Harrold family is connected with Quaker families like Rees, Dillon, Mills and Mendenhall. In fact, when you look at the evidence in total, the conclusion seems most likely that we descend from the Quaker Harrolds of North Carolina! Jonathon Harrold Jr., (son of Jonathan Harrold and Catherine Hiatt) married Charity Beeson. According to Cheska Wheatley, this Jonathon Harrold Jr. had a son named Amasa Harrold. Unfortunately, she has no further info on him as his father was dismissed for marrying out of the Quaker faith (thanks, William!). This Amasa Harrold would have been born around 1775 (based on the ages of Jonathon Harrold and Charity Beeson), probably in NC. I've also heard from someone else that the Harrolds changed their name to "Harold" after this... Keep this in mind! I know only a couple sure things about *my* Amasa Harold: #1 He had at least two children, my Uriah and another, Andrew (married to an "Anna Horton"). #2 He was born in North Carolina and died in probably Greene County, Tennessee. In the Greene County, Tennessee census of 1850 there is an Amasa HAROLD living with an Andrew and Anna HARROLD (and their family). This Amasa HAROLD is listed as having been born in North Carolina and is listed as 75 years old. the Amasa Harrold in my lineage probably died in Greene County, Tennessee. That the reason the Amasa Harold in that 1850 census was not listed as HARROLD was due to the "name change" the family undertook after being dismissed. Andrew then took the old name back for his family as he had no ties to the squabble that gave rise to the "name change". That the Amasa Harold in that 1850 census is the son of Jonathon Harrold and Charity Beeson. The dates fit, as do the ages. If you believe that the Amasa on that 1850 census was 75 in 1850, that would place his birth in 1775. That would fit perfectly with a 27 year old Jonathon Harrold Jr. being his father in NC! So, that's my theory. What do you think? If you have *ANY* information on our line, please email me. We'd love to add your gedcom files, photos, stories and documentation to our site. And, if you are of our Harrold line, we'd like to offer you a website at harrold.org where you can proudly display your Harrold family heritage!